SO LET’S START BY GIVING THE READERS A LITTLE BIT OF INFORMATION ABOUT MR.RON RAMOS, AND WHAT IS YOUR HISTORY WITH DOGS IN GENERAL? I’ve pretty much have had dogs my entire life living out in the country. As a boy my pops had a love for dogs as well so we had pedigreed dogs of all breeds from Poodles, Rottweilers, Chihuahuas and many others. I got my first registered pitbull in 1983 and started showing in 1997 and never looked back. I have showed in the AKC, UKC and the ABKC. I have shown in many prestigious shows in the AKC and UKC Nationals a few times and placing in the ribbons just about every time. I came on board to the ABKC in about 2004-2016 took on the duty of director of Judges for the ABKC and pretty much built the foundation of the documents from the judges code of ethics to the judges test with the help of a few others. I have been blessed with the bully community to have travel the world and they have welcomed me with open arms around the globe. To this day I have been blessed to be sought out to judge across the world with many groceries and many clubs. To say the least the bully community has truly been a blessing! Ron “Papa Pit” Ramos can not thank the people around the world enough. It’s safe to say you that you have some serious dog knowledge. How long have you been judging dogs? Sorry I got ahead of myself. I started judging in 2004 so 11 years and counting. So why did you gravitate towards the American Bully out of all breeds? I have always loved the pitbull out of all the breeds I have owned. But, I have always loved the heavier dogs before they were called bullies. 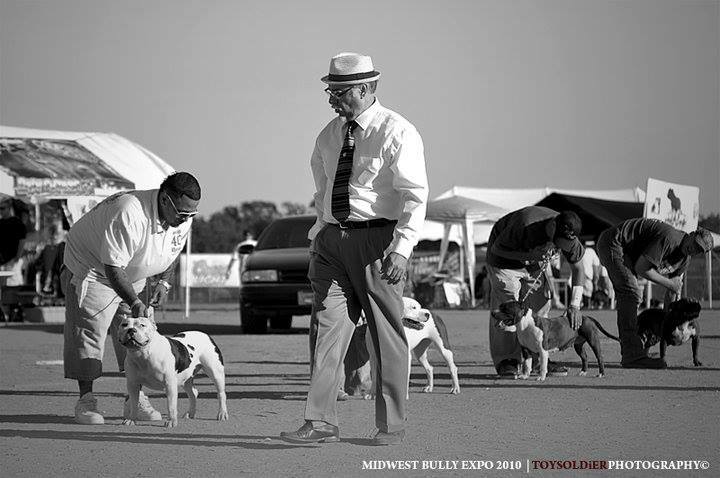 Even before my first registered UKC pitbull I had an old Crenshaw that was built exactly like a pocket bully that had to be in the late 70s, and loved that dog. Sounds like you were ahead of your time. Well what is your ideal bully or favorite standard and why? Being that I have had Game Dogs, Pitbulls, Amstaffs and American Bullies in both the standard and pocket varieties, I have developed an appreciation on more of what they were bred for so I can’t take away from any of them. This is where many people fall short and hate on one another because of the lack of understanding the “why” of the breed. I can look at a beautiful game dog and love it as much as a standard bully if they are bred correctly. WITH THAT BEING SAID AS A JUDGE WHAT DO YOU LOOK FOR IN AN AMERICAN BULLY? No matter what the breed type of an American Bully I like a balanced look. I like everything in correct proportions with confidence and power when it moves. Ok, so when it comes to your program what is your goal or vision? As a breeder I don’t ever think I will be totally satisfied especially as a show breeder. We are constantly looking to breed the Golden Bully a.k.a.The Ultimate Bully! Don’t get me wrong I have some very nice dogs, but I don’t think I have my Golden Bully just yet. So who do you believe is your best production to date in your program? I love my dogs and I could give you a list LOL, Ramos’ Porky was one of my first home grown bullies and I will always put him at the top. Then there is Ramos’ Terminus Q and the peoples favorite Ramos’ Too Thick Nick who is a must see in person pocket bully. When people see Nick it’s a done deal, and they melt the imagine of Pooh Bear in a bully LOL. Right at the top has to be Ramos’ Perfecta Perfina. She is an incredible girl who could pass for a male. In fact, people look to her underside when I say she’s a female to make sure LOL. AFTER SEEING SOME PHOTOS OF YOUR BULLIES THERE IS NO DOUBT THAT YOU HAVE AN AMAZING PROGRAM. SO IN YOUR OPINION WHO DO YOU THINK IS THE BEST AMERICAN BULLY OUT THERE NOW? You know I have been asked this many times and to name a handful of dogs is an injustice to the many I have not seen in person. Besides, everyone believes they have the best dogs in their backyard. I guess it’s similar to looking at our own children as we all think they are perfect lol. What do you think about the state of the Bully Community now, is it growing stronger and in the right direction? I don’t think it’s even fair for a judge to even determine which dog because every dog has their high points and short comings. Many people talk about certain dogs being great and they use their offspring as a gauge, but that is a poor measuring stick. It should be based on the ratio of productions to quality of offspring. For Example: If a dog is deemed as a great Bully and has produced 1,000 puppies but only has 50 great offspring versus a bully that has produced 100 puppies, and has 25 great offspring which is the better producer hmmm? So when you hear some of the dogs being mentioned as great dogs, and look at their offspring you should also take a second look to see the numbers. Sorry if that wasn’t the answer people were looking for, but this is my honest opinion. Well being honest is always the best advice even if it’s not what someone wants to hear. So before someone decides to own an American Bully what would be your top 3 to 5 tips that you would give them that are very important? 1. Don’t be in such a rush, your money honestly won’t burn a hole in your pocket. 2. Don’t buy the first fat cute little puppy you see. 3. Do your homework, and I don’t mean just looking at pedigrees. Understand what your looking at, and develop an eye for what a pup will finish as an adult. Look at the both the sire and dam, then look at their parents. Many times people get blinded by what is in front of them, and never get past that. The more litters you look at the better you will develop an eye for what you’re truly seeing. 4. Price doesn’t make it better or who the breeder is! A 10,000 dollar puppy that is a wreck is still a wreck at 100 dollars. Price and big name breeders are mostly hype now, but don’t get me wrong not all of them. I am sure there are many big name breeders that are 100. 5. Do it for the love of the breed and not for the fantasy of making big money. There is maybe a handful of guys that have made big money in the dog world. Make sure you hook up with an ethical breeder that will help, and mentor you. Do not just deal with a breeder who will take your money and disappear. Great breeders will be there to answer questions and teach you the ropes. That’s all great advice Ron. 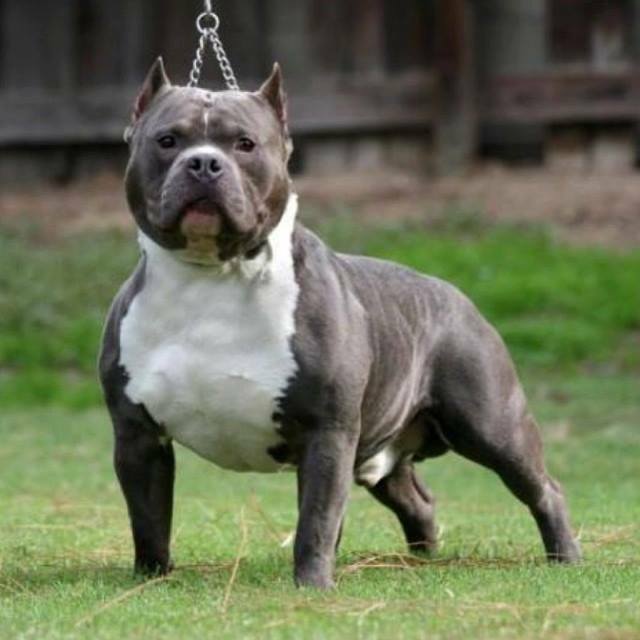 As the breed gains more popularity where do you see the American Bully 10 years from now? I wish I could answer that with an objective answer but this is determined by the trend of the people, and the almighty dollar. God willing people will look to the quality of the breed, and not the next trend or look. I have seen this in many breeds of dogs, not just the in the bully breed. This is an awesome animal with great potential. We need to give the respect it deserves, and reciprocate the love it gives to use in return. Don’t let the breed down, and do your part. God willing in ten years it will be bigger and better then ever. If I’m still around in ten years I hope to see an amazing bully community with awesome bullies, and me being rolled out in my wheelchair as a special guest LOL. Well we appreciate your time again Ron. Is there anyone you would like to shout out or any websites or social media sites you would like to plug? All my gratitude and thanks goes to the bully lovers around the world. If it wasn’t for them none of this would never be possible. I came to this community to mentor and grow it to the next level, and hope I did that. I take my hat off to the bully world and bow with a humble, and inadequate THANK YOU. Last but not least, a thank you to my true close friends, my wife and kids for always supporting my obsession to mentor and teach about the breed I love. Thank you again Ron. From this interview alone we have learned so much about the breed and again it is such a HUGE Honor to have you come on board and share your knowledge!